Azrael's Stop consists of a story told in daily pieces online, as well as an album of music that accompanies it, including many songs from the story. The best way to experience it is to purchase the full story as an ebook, along with the album. Both are available in our store. Azrael’s Stop will culminate in a separately-published anthology of stories submitted by its fans. 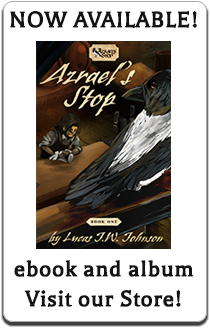 Azrael’s Stop is Silverstring Media’s first original production, with story written by Lucas J.W. Johnson and music by Devin Vibert, and it is the first introduction to the Flowforged setting that will feature in much of our work.